At fifty-three pages, Tenderness (Meekling Press 2016) has a pleasant feel in the hands. 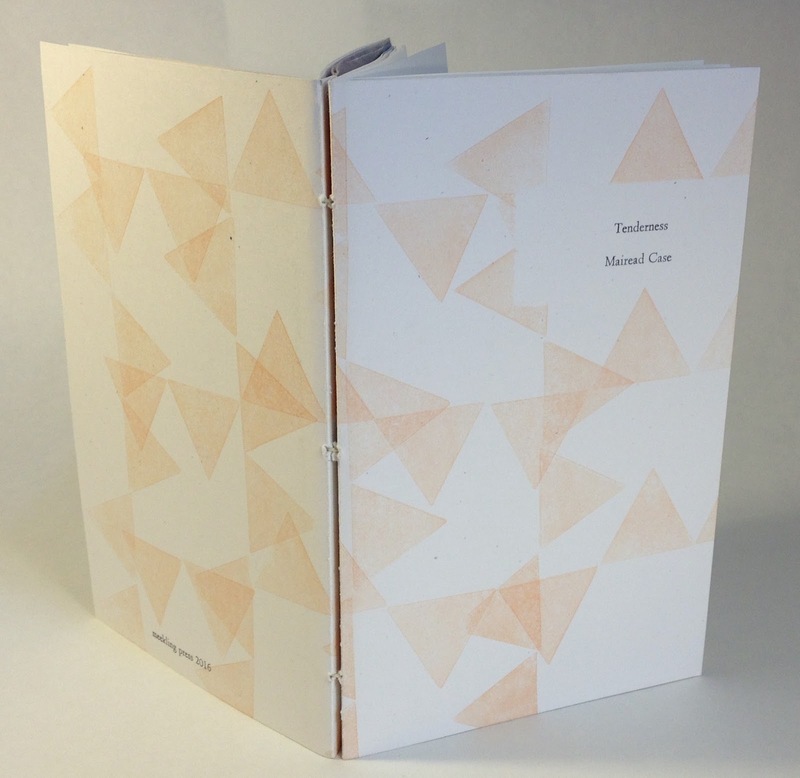 The cover is a simple triangle print motif, and the chapbook itself is two sections sewn together with what appears to be a handmade paper insert illustrated by Joshua North-Shea with one of the book’s gems--a gnarled, learning tree, which seems to evoke the title by its simultaneously steadfast and fragile appearance. One of the more intriguing poems contains sections numbered from one to twenty. It starts with a description of Malachi Ritscher’s self-immolation during morning rush hour in Chicago in 2006 to protest the Iraq War. Here Case weaves her own experiences of being in Chicago and feeling out her relationship to Ritscher’s actions. The poems range from several prose poems, to fragmented poems where gaps open the reader space to imagine behind the scenes, to more familiar contemporary poems. Case’s language is direct and occasionally straightforward, but never simple. She clearly calls the reader to engage with her work. None of the poems are titled and they are sparsely punctuated. The lack of titles is occasionally difficult on the layout level, because it is not always clear when a poem has stopped and another started. I think there are forty-four poems in the book, but I cannot be certain. The punctuation plays on this dichotomy that seems to be the theme of this chapbook – it simultaneously engages the reader to see the poems creatively rather than read them as formal prose, and it makes the poems more challenging, potentially for the worse. The cover of my copy is slightly rough-cut in a couple places. Meekling Press produces handmade editions of their books, which in this case results in the contrasting beauty of the hand sewn double section and center illustration with the rough cut and pixilated text and illustrations throughout the book. I am a proponent of handmade artsy funk but I believe that one can either take that the direction of really funky or high quality production art. The production on this book unfortunately achieves neither. Nit-picky layout and production notes aside, the content is naturally what matters most. I will be keeping my eye on both Case’s developing work (she is also the author of See You in the Morning, a poetic coming of age novel) and the work at Meekling Press. Tenderness is available at Meekling Press for $7 https://squareup.com/store/meeklingpress/item/tenderness-mairead-case.